This humanitarian organization has agreed with the state of Italy on a certain level of sovereignty in 1966, expressed mainly in the issuing of stamps and coins. One should draw attention to their stamps, since they are mostly heraldic and vexillological (and history of art, but we are not dealing with that here?). Most of the serious stamp dealers don't recognize those stamps to be real stamps, but for vexi-freaks, they are quite interesting, and I dare say a valuable source of (primarily) coats of arms. The Order has its branches (missions) in many countries of the world, and their stamps are recognized by 44 states (until 1994). However, on some of the stamps there are images of the flag of the Order, red with a white Maltese cross. On all the images the flag is shown flying, so it is difficult to estimate the proportions. Is seems to me that 1:2 is approximate enough. Seven years later [the Knights Hospitaller] were given the island of Malta by the Emperor Charles V of Spain. ... The Order had always contained people of different nationalities and was organised into eight national 'Tongues', which were, in the official order of precedence, those of Provence, Auvergne, France, Italy, Aragon, England, Germany and Castile-Portugal. The British occupation in 1800 (...) found the knights dispersed and disunited. Subsequently, they established their headquarters in Rome, where their claims to sovereign status are recognised by more than thirty countries with which they maintain diplomatic relations. This is exclusively a Roman Catholic and a religious Order, known now as the Sovereign Military Order. SMOM is sovereign and has diplomatic ties with a number of countries, but it has no territory except a few buildings used for administration. The Sovereign Military Order of Malta is a sovereign entity according to international law, but is actually used as a classic example of an entity which is sovereign (like a country) but is not a country. It does not have a territory, and therefore, it does not live up to the requisites of a country. A sovereign entity does not have to be a country. SMOM is an example of this. For sovereignty, it is generally considered that the entity should be recognized as such by other sovereign entities. Literature on the subject: R.M.M. Wallace: "International Law", Sweet & Maxwell, 2nd edition, London 1992, page 76. The case of the SMOM is an interesting matter. Different books on international law give different explanations. Some countries consider it as a sovereign organization, others consider it as a country without territory, others consider it as the world's smallest country. Whether it is a country or not depends on the status of the headquarters of SMOM (a building and a garden - 6000 square meters). The headquarters have an extraterritorial status, but it is not clear whether it is the territory of the SMOM or it is the embassy of SMOM in Italy. In any of the two cases, I think that the SMOM should be considered as a country, as it has many of the functions of a country: it has diplomatic relations with many countries, issues passports (only countries, the Red Cross, and the UN issue passports), and it's a member of a few international organizations. I have at hand a book, "Report from Practically Nowhere" by John Sack, copyright 1959 et seq., published by the Curtis Publishing Company, with chapters about visits to Andorra, San Marino, Lundy, Liechtenstein, Sharjah, Athos, Swat, Punial, etc., with a chapter about the S.M.O.M. wherein is stated that, by agreement with the Italian government, citizens of the S.M.O.M. are limited to three: the Grand Master, the Deputy Grand Master, and the Chancellor. These carry S.M.O.M. passports. The numerous other members of the order remain citizens of their own respective countries. The case of SMOM is similar to the Vatican's case in this sense. The Vatican also has citizens (1500 persons), but there is nobody with only Vatican citizenship. For example, the Pope [John Paul II] is citizen of both the Vatican and Poland. The other peculiarity is that the Vatican issues only diplomatic passports, so this is a country, where all the citizens are diplomats. SMOM has the same practice. A month ago there was a scandal in Hungary with the chief of the humanitarian service of the Hungarian branch of the SMOM. In the news there was the following information: he was beaten in Romania and both his Hungarian and his SMOM diplomatic passport were stolen. According to <www.smom-za.org>, SMOM has diplomatic relations with 75 countries. It also has permanent observer status at the UN and Italian recognition of its extraterritorial rights over its properties in Rome. Given the humanitarian activities of the SMOM, I'd guess that the value in having it recognized as a sovereign entity is that it can be seen as neutral, allowing SMOM into a war zone or wherever doesn't have to carry the political baggage it might have if SMOM were a corporation operating under the laws of Italy, let alone the United States, for example. According to the UN's official site <www.un.org>, SMOM maintains a recognized permanent observer mission in New York. SMOM is not categorized by the UN as a non-member state (like e.g. the Holy See) but among "entities and intergovernmental organizations having received a standing invitation to participate as observers." The Sovereign Military Order of Malta is a sovereign entity in international law, with diplomatic missions to 92 countries and permanent missions to the UN, the European Commission and other international and multinational organisations. The Order's continued sovereign status derives from its established acceptance as such by other sovereign states, rather than from its possession of an extensive national territory. As such, it is an unusual example of a sovereign international entity, similar to the Vatican City State. The extraterritorial seat of the Order is in Rome. Aegean Sea, Malta, etc. And it has at least 2 territories: The Palace of Via Condotti in Rome and the Fort Saint Angel given by the government of Malta a few years ago. The present "territories" of SMOM are not considered territory any more than an embassy of a foreign country is considered its territory in any country. Thus, SMOM does not have a territory. The SMOM also ruled the island of St. Croix in the Caribbean from 1651 to 1665. I've taken a look at the order's own website and other references and as far as I can tell SMOM itself does not claim to be a state. It describes itself not as a state but as a "sovereign subject of international law." That seems to mean that it can make treaties, etc., but it apparently acknowledges that it has no territory or people of its own. As someone has noted, its facilities in Rome and elsewhere have a status equivalent to that of an embassy. An embassy possesses sovereign immunity from the jurisdiction of the host state, but it is not actually part of the territory of the sending state. Apparently the logic of the SMOM position is that the Order has always had sovereign status independent of whatever territories it may or may not have occupied from time to time. If it had been a state, its sovereignty would have been extinguished when its home territories were conquered, as happened on three occasions. SMOM is a legitimate and highly praiseworthy organization and is widely recognized as possessing sovereign status (useful in fulfilling a nonbelligerent honest broker's role in wartime situations). It just isn't a "state." There are other Orders of Malta besides SMOM, some of which are reasonably legitimate successors of the original order (the Protestant branches in Germany, Sweden, and the Netherlands, for example); one of which (in the UK) has a questionable lineage but is recognized by the British crown and, like SMOM, conducts important humanitarian operations, especially ambulance services; and many of which are entirely fraudulent or recreational, mainly, I believe, here in the United States. [T]he clear territorial separation of sovereign areas that exists between the Italian State and the State of Vatican City does not exist between the Order of Malta and the Italian State, but neither can it be said that the treatment given to the headquarters of the Order (Aventine, Via Condotti) is, simply, that reserved for the headquarters of diplomatic missions accredited to the Italian State. In fact, the headquarters of the Order have diplomatic extraterritoriality (authoritarian acts of any kind � executive, acts of inspection, judicial � cannot take place inside), but in addition, the Italian State recognizes the exercise, in the headquarters, of the prerogatives of sovereignty. This means that Italian sovereignty and Maltese sovereignty coexist without overlapping, because the Order exercises sovereign functions in a wider area than occurs in the diplomatic missions of the States for, although enjoying extraterritoriality, the guarantees deriving from the privilege of immunity [in those diplomatic missions] are constrained to a purely administrative area; the Order, instead, makes use of extraterritoriality to meet the very acts of sovereign self-determination that are the same as the States (legislative, judicial, administrative, financial acts). My DK flag book says that the "Order of St. John" flies a reverse English flag (my description) in Britain, but the Maltese cross in Rome. Is this correct? If so, are the Sovereign Military Order of Malta and this Order the same thing? Two different orders. After the Reformation, several of the branches of SMOM were completely Protestant, so they left SMOM, but kept on doing more or less the same. There is a formal cooperation between these orders nowadays, in part to keep more or less phony orders from infringing on the accumulated goodwill. The SMOM is the Order of St. John, however in England (and the Commonwealth and even the US) the order which claims descent from the Order of St John (in particular, from the English Langue of the Order) is the "Most Venerable Order of the Hospital of St. John of Jerusalem" which was granted a royal charter by Queen Victoria, and from which springs St. John Ambulance in all its various forms. See St. John Ambulance. The flag of this order is the "reversed English flag" (the cross of St. John) with the Queen's crest in the canton. The flag of the Sovereign Military Order of Malta, abbreviated to the Order or SMOM, is a red flag with a white Latin cross. There are several books about the Order. Recent ones include: H.J.A. Sire - The Knights of Malta - Yale University Press, ISBN 0 300 05 502 1 and Rosita McHugh - The Knights of Malta 900 Years of Care - The Irish Association of the SMOM, Dublin ISBN 0 9525810 0 0. This flag is shown in Album des Pavillons, but with proportion 3:4, and labeled "Flag of the Order". The flag with the white Maltese cross on a red field is the flag of the Grand Master in Rome, very similar to the Maltese Republic civil ensign (same with a white border). At the Expo'98 this summer in Lisbon (both at the fairground and in all the printed material I saw), the flag of the Grand Master of the Order - red with white Maltese cross in the center) was in display, and not the Above one (red with white cross throughout). I seem to recall that the cross existed as a heraldic charge associated with the Order of the Knights of Saint John long before their seat was established at Malta. In "Flags in South Africa and the world", Proceedings of the XVIIth International Congress of Vexillology, there is a rich paper by Adrian Strickland, entitled: "The vexillological heritage of the Knights of Saint-John in Malta" (pp. 277-287). According it , the flag and ensign of the Order proportions should be 2:3 and width of the cross arm 1/5th of the hoist width. The Order's flag is called in Maltese "Ir-Religjon". When I visited Prague, I passed next to SMOM embassy. I have the flags that was hoisted there on video. I checked it again to make sure. In the two entrances and on the building itself there are the same flags, but those are not the flag on top but the Grand Master of the Order (by Antonio Martins) flag. Since the Grand Master doesn't live in Prague it seems that something is wrong here. The book "Hospitallers - The History of the Order of St. John" doesn't actually mention a flag, but has many illustrations of paintings showing the use of the plain white cross on red. There are also a few examples of a white cross with the ends of the arms splayed on red. Apart from this, there is also a map dating from c. 1722-36 which includes a panel containing the coats-of-arms of the grand masters, supposedly from 1118, re-engraved to include 4 more grand masters after the original drawing of the map. (Banners of Arms of some of these are also seen in other illustrations). The first coat of arms depicted is the white cross on red, and is labeled 'Croise de la Religion'. The rest have the white cross on red in the 1st and 4th quarter. The map itself is at the museum at St. John's Gate, Clerkenwell (UK). The book also names the SMOM as 'The Sovereign Military and Hospitaller Order of St. John of Jerusalem, called of Rhodes, called of Malta' as opposed to the 'of Jerusalem, Rhodes and of Malta' or 'of Jerusalem, Rhodes and Malta' alternatives. Recently I found the web page <www.smom.org> with a photo of the SMOM prince and grandmaster Andrew Bertie signing some international document (and sitting next to the representative of Mozambique). In front of him, the red flag with the white "Maltese Cross" is displayed. Moreover, article No. 6 of title I of the Constitution of SMOM says: "Par. 1 - The flag of the Order bears either the white Latin cross on the red field or the white eight-pointed cross (cross of Malta) on the red field." Are there two flags of the same status? right - red flag with white Maltese cross. It seems that SMOM (BTW, it is a subject to international law ruled by the prince, in other words, SMOM is a "state") has indeed two variant flags. Yesterday I've received two images from the Embassy of SMOM in Latvia. I've asked the embassy for pictures of "flag and coat of arms for representation of SMOM in encyclopedia". Here are both coat of arms and flag (red flag with the white "Maltese Cross"), courtesy of Embassy of SMOM in Latvia. Note, the Embassy fly flag with plain white cross. The two shapes of crosses don't present a case of evolution form one to the other. The 'elongated Iron Crosses', the sort of thing that in the Templar case gave rise to the St George's Cross of England, were used by both the Templars and the Hospitallers as their banners and arms. I haven't come across anything about the white-on-black to white-on-red change of the Hospitallers, but several orders with some sort of descent from the Hospitallers use the 'inverted English flag' in some form to this day. At the same time, both then and now, the eight-pointed Maltese, or St John, Cross was used as a badge. It actually originated as the badge of the republic of Amalfi, and quite possibly was not originally a cross, but an emblem made up of four arrowheads. It was adopted by the Brotherhood of the Hospital in Jerusalem (even before the foundation of the Order) when the merchants of Amalfi re-purchased the site of the hospital established around 600 AD and rebuilt it. At the formation of the Order (formally recognised in 1113), the monks wore black robes with the eight-pointed cross on the left breast. It seems correct to understand that the white cross on red was mainly used by the Knights of the Order in their military activities, and the eight-pointed cross while at the convent. In the 19th century, when Orders of Chivalry were a popular thing among many classes, the English Langue, or Tongue, of the Order was revived in England (having been eliminated in the time of Henry VIII and the following monarchs). This is the part of the history where I have come across many different interpretations, as this was at the time when the Order was least organised, having been driven from Rhodes by Napoleon. The current Sovereign Military Order of Malta is probably the most valid direct descendant of the original order, but this is the time where there is the most doubtful continuity. The English Langue was revived in the authority of a French group who claimed authority over the Sovereign Order at the time, but the Lieutenant Master later refused the acceptance of the proposed Protestant Priory in the Catholic Order. So, not being accepted as part of the international order, an English order of chivalry was formed independently in Britain, using the symbols of the order dating back to the crusades. 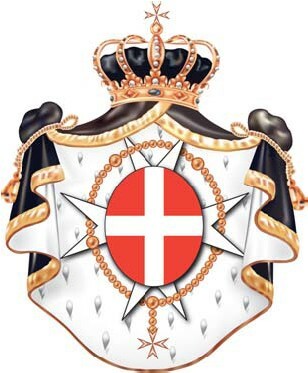 The flags of the Sovereign Military Order of Malta can be found at smom.html on your favourite mirror. Association (teaching first aid), Brigade (doing first aid as an organised brigade) and established a hospital in Jerusalem, focusing on ophthalmology. The Order's full name is now "The Grand Priory of the Most Venerable Order of the Hospital of St John of Jerusalem". The work of the Order and it's foundations, particularly the Association and Brigade spread throughout the British Realm. The Association and Brigade (in Australia since 1987 called the Training Branch and Operations Branch) continued to use the Maltese Cross with lions and unicorn badge, whereas the white cross on red (with Queen's Crest) flag remains a symbol of the Order itself (which also now has Priories in many, mainly Commonwealth, countries). In Australia, the Ambulance services in general have taken up the eight-pointed cross, and so most people would associate it with ambulance services, and possibly with first aid. It is not surprising that the state ambulance services use the "Ambulance Cross", since the ambulance service is actually run by St John in Western Australia and the Northern Territory, and were at one stage in NSW and South Australia. I have also heard, but have my doubts, that the Tasmanian service is now run by St John. According to Payrat (2000) - Flag of the Order (2:3) - Red flag with white cross throughout. Album does not give FIS dots (just as well, they are meant for national flags and like, while the SMOM flag is difficult to set among these, but this is an other issue), but if one would insist then CSW/CSW would be appropriate, I guess. The upper line C is unquestionable, I guess (any member of the order could use it). S also, all Order bodies use it, while W is questionable - though the Order is military and their "army" uses this same flag as well. For use on seas - I question the C-use - there is, as far as I am aware no civilian (merchant) fleet of the Order. However, there might be "state" vessels for S, and these would also be W in a way. Anyway, most of this is just a theoretical issue. The Order seems to choose to show the two flags (flag of the Order plus the flag of the Grand Master) together whenever there is chance to showing two flags. Only when there is need for just one flag, the flag of the Order is chosen as a rule. We show also both flags, but it should be noted clearly that the other one is the flag of the Grand Master. Could it be that the SMOM runs churches? I'm asking because when one of the Portuguese bishops retired, there was a news item on him, with an interview and some footage of him after retiring, and at a point of the interview the man entered a large church or cathedral (I don't know where, but at that point the off-voice was talking about the Portuguese city of Beja) that had large vertical flags hanging at the door. One was a white Maltese Cross on red (also with a white and red border) and the other a white Latin cross on red. Alternatively, could the bishop have been a member of the SMOM, and might the flags have been displayed in compliment to him? Was the visit to the church part of a special ceremony? Well, the man was dressed in simple priest clothes (black jacket and pants, grey shirt with white collar), not in the shining bishop "dress", and the church was nearly empty, so I don't think there was a ceremony there. Actually, he behaved a bit like a tourist, so I'm not even sure it was taped in Portugal. In any case, your two other hypotheses (that he's a member of the SMOM and the the flags are hanging for him) cannot be excluded. Or that in that day some SMOM member visited the church. I just don't know. In relation to the discussion about the existence of Maltese churches in Portugal, I can inform you that there is one church in Lisbon who flies the other flag of the order (white Maltese Cross on red) whenever I pass through it. It's the Church of St. Luzia and St. Br�s, in the Lg. de St. Luzia. The church also displays Maltese Crosses as architectural ornaments on the outside. I never went inside though, so if there are any flags inside I wouldn't know.